Looking for a historical novel? A western? Maybe one with spies, outlaws and intrigue? How about a plot to keep California from joining the United States of America? How about all of these at once? Pick up a copy of Tamer: an Amos Kuttner Novel, the first in William E. Wallace's series about the crime-fighting adventures of a lawman in Gold Rush California. When Captain Amos Kuttner, a specialist in unconventional combat who spent twenty years fighting Mexicans and Indians on the American frontier, leaves the U.S. Army to roam Gold Rush California at the end of the Mexican-American War, he is hired by the territory's last military governor as a "Tamer," a special law enforcement agent probing the murder of miners in an isolated part of the Gold country. There he learns of a sinister plot that endangers the entire United States. 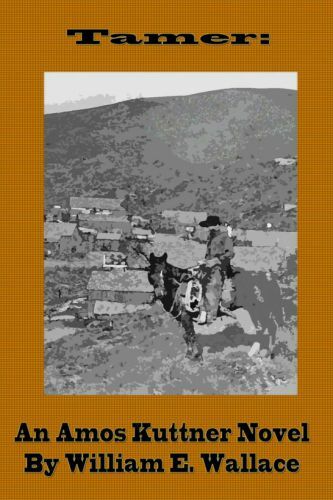 Part Western, part detective yarn, part spy novel, William E. Wallace's Tamer takes readers on an action-packed and intrigue-ridden tour of the violent and lawless California territory, an untamed region infested by Barbary Coast cut-throats, renegade U.S. soldiers and assorted gunmen and outlaws. Will the governor's newly-hired "Tamer" save the 1849 Constitutional Convention aimed at bringing California statehood or will he fall victim to the plotters' bullets? Read Wallace's latest book, Tamer: An Amos Kuttner Novel, to find out. Now available for only $2.99 at Diesel e-Books (click on link above), Amazon, Kobo, Smashwords, and other eBook dealers.